We woke a half hour later than usual and met with Laura and Donny again. They fixed us an awesome hearty breakfast to start our day. But there was more! We had run out of Tortillas and Hot Chocolate and they not only supplied those, but Laura made Chocolate Zucchini Bread (from home grown zucchinis), cookies, home made Smoked Salmon and home made Elk Jurkey. About 95 lbs of food (Well, it seemed like it 😜) that we gladly accepted. We started about 90 minutes later than usual (Best delay ever!) and the first half of the day went well. 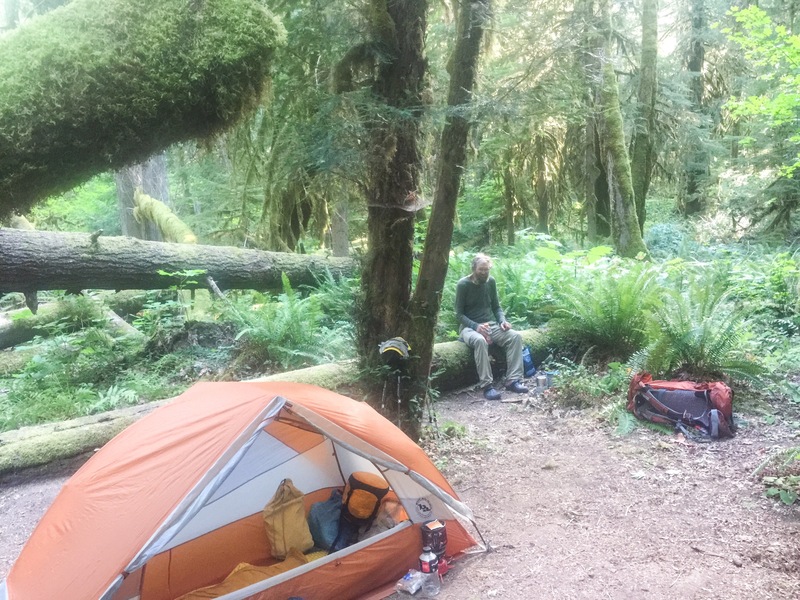 We planned on doing just 15 miles and the camp was near a spring, so we didn’t carry extra water. Why carry the water weight and all the extra food? 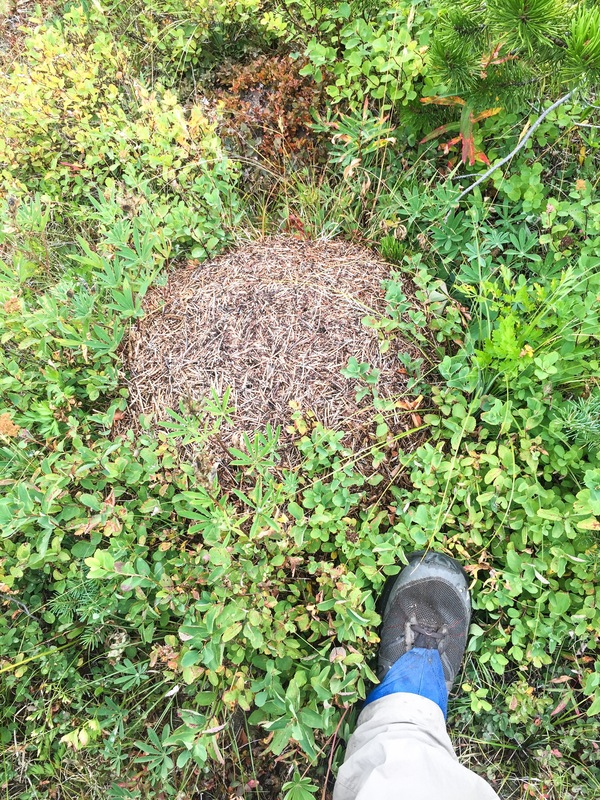 Sadly, the whole south side of Mount Adams was a recent burn area from 2012; The spring was dry, the campsite was simply gone and we were low on water. You’d think we would know better! 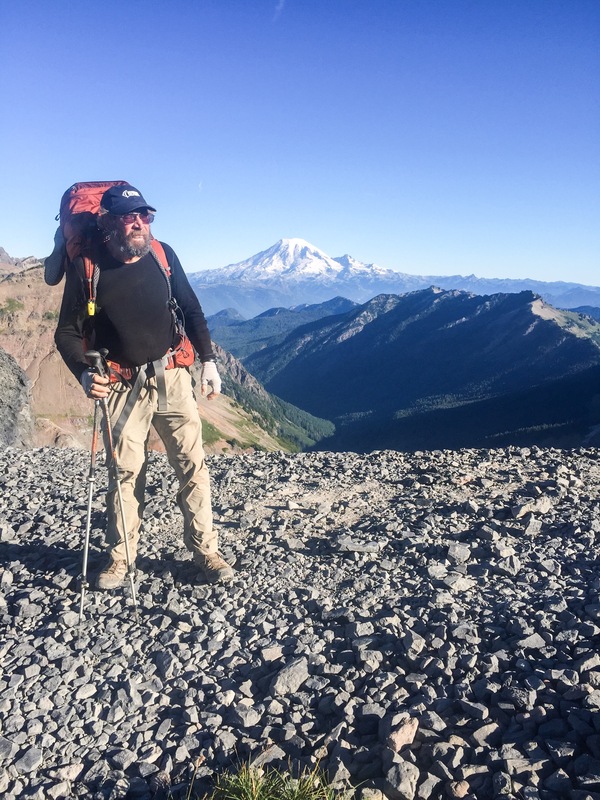 The next water was a lake on the west slope of Mount Adams, 5 miles away. We motored on and finally reached a campsite next to the lake about 6:30pm. While the views from 6,000ft on the west slope were amazing, it was a very long, thirsty and exhausting 20 mile day. 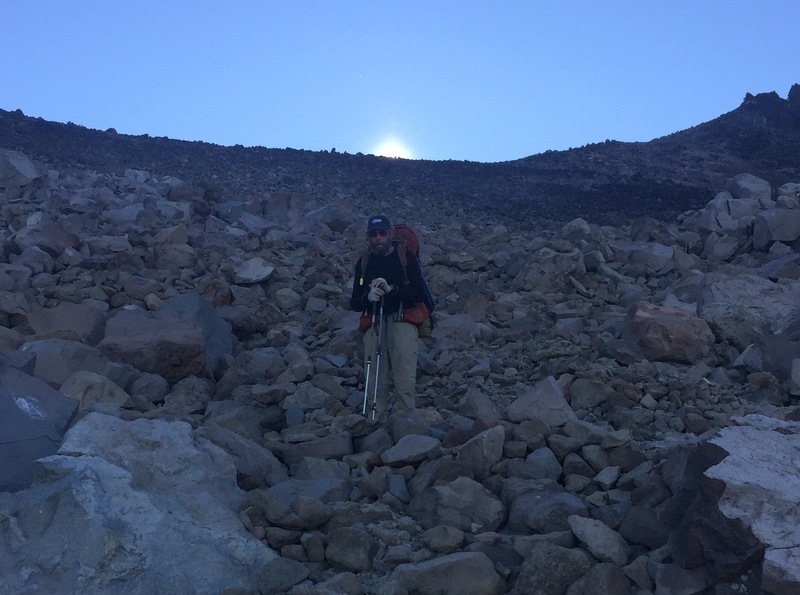 Imponderable: why were the two guys night hiking at 3:30am? I can see doing it in Southern Calif to avoid the heat, but Washington? 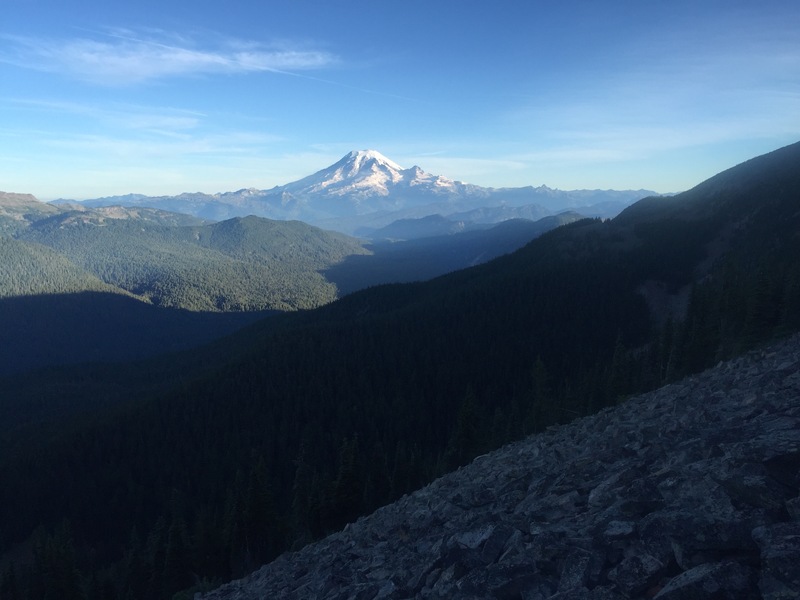 More great views of Mount Adams up close, Mount St Helens and Mount Rainier. Tired from the previous day’s hike, we just did 15 miles and camped between two small lakes. We were early enough that we took a quick bath in one of the lakes. Since entering Washington, we’ve seen a lot of dead trees. Most of these are still standing, many have already fallen. Two nights in a row I’ve heard trees falling. The one last night was very loud and lasted a while. Sometimes multiple trees go down, Domino fashion. Every day we have to climb over or go around fallen trees on the trail. Kinda sad. 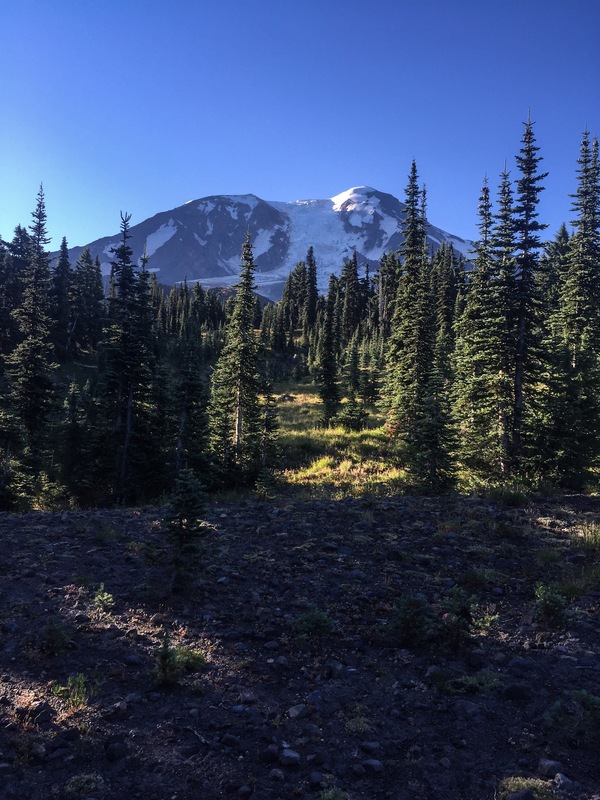 A couple of views of Mount Adams and one of the Glacier streams. The Glacier grinds the rocks into powder and it desolves into the water making it milky white. Today was a hard day: we did Cispus Pass. (6,500ft) While not high compared to the Sierras, it was still 3,000+ ft of climbing and we finished 18 miles. The pass was very rocky and bare. The scenery was stunning. This part of the Cascades is rugged. 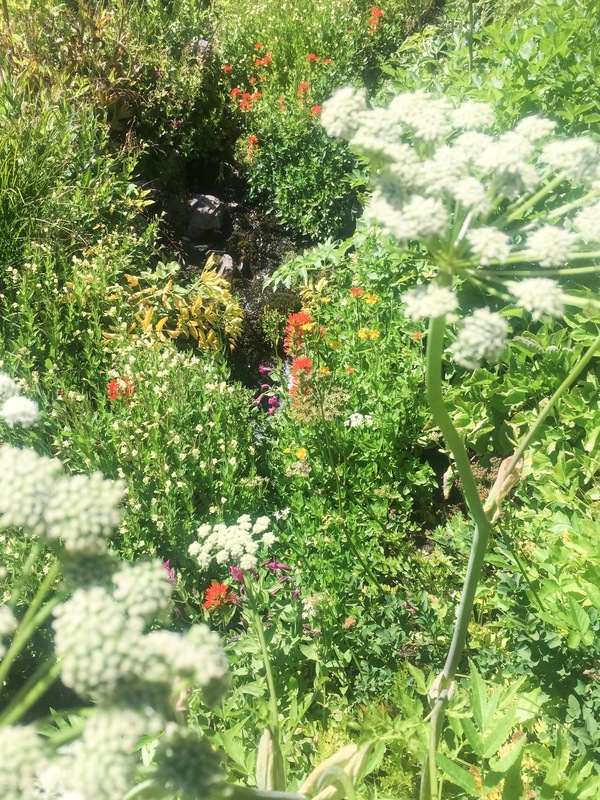 When water is found, it comes from springs and is really, really good. Our camp was high on a cliff overlooking a deep valley with great views. 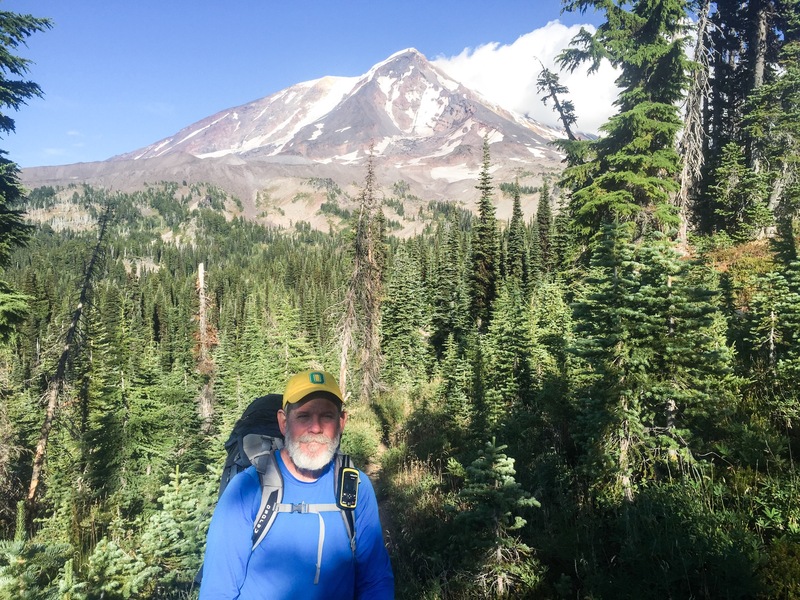 Below is Turtle nearing Cispus Pass, wild flowers near a spring and the morning with Mount Adams peeking over the ridge. Today was one of the toughest in months. It started with a modest climb through a series of high meadows. Then we were in the Rock and stayed there for the next five hours. 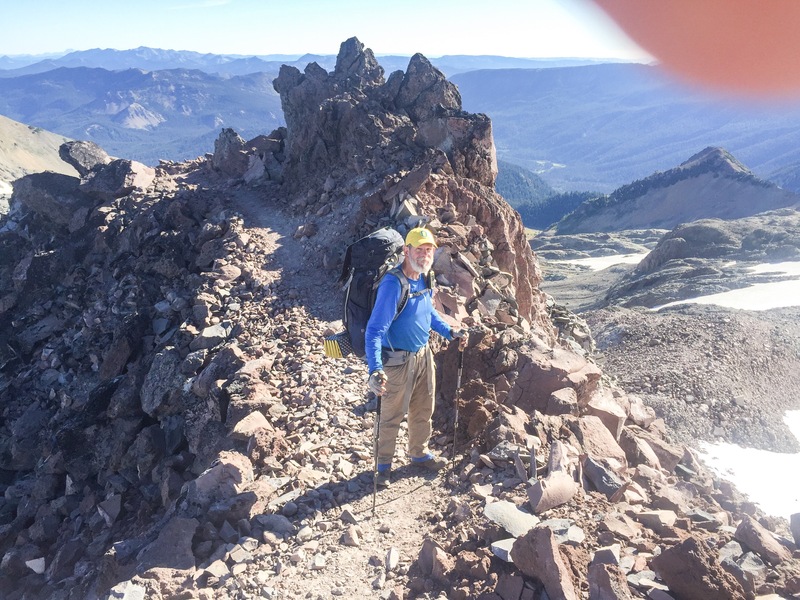 The goal was an optional side loop trail called Old Snowy, otherwise known as the Knife Edge. The views were incredible at the top. The elivation was 7,600 ft at the top, and we had to go down to 5,400 ft to camp. Even though we did only 13 miles today, it included 3,500ft of gain and nearly 4,000ft of loss. The downhill is what did us in. Mile after mile of loose rock on steep trails makes for slow going. That’s a tough day for us old guys, folks. We’re camped near a spring with wonderful water. (Some are just blargh). 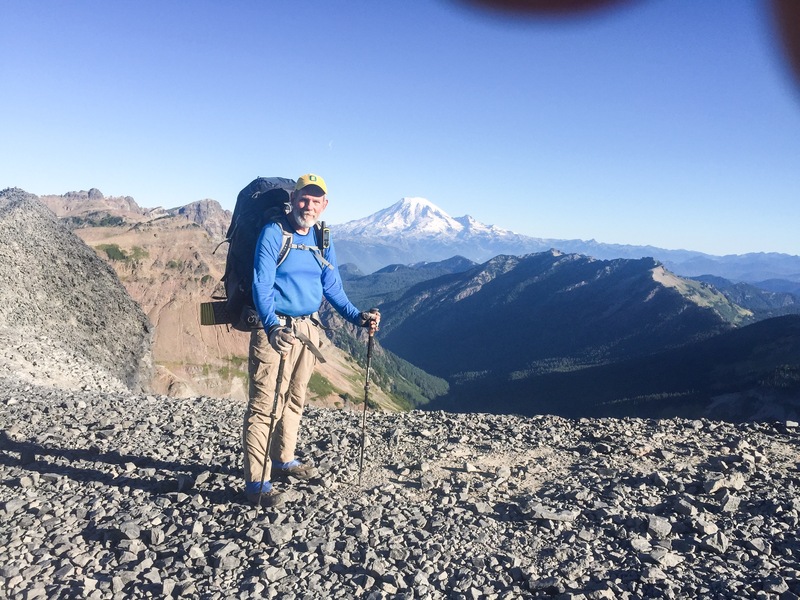 Pictures: Me and Turtle with Rainier in the background. 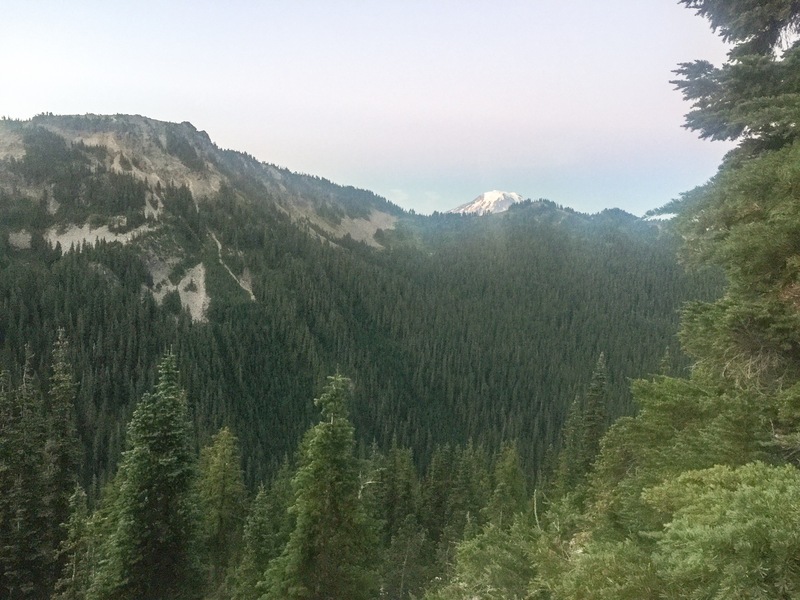 Panorama From the top of Knife Edge of three volcanoes: Adams, St Helens and Rainier. Turtle with the morning sun coming up, me and Turtle on the wide part of Knife Edge. 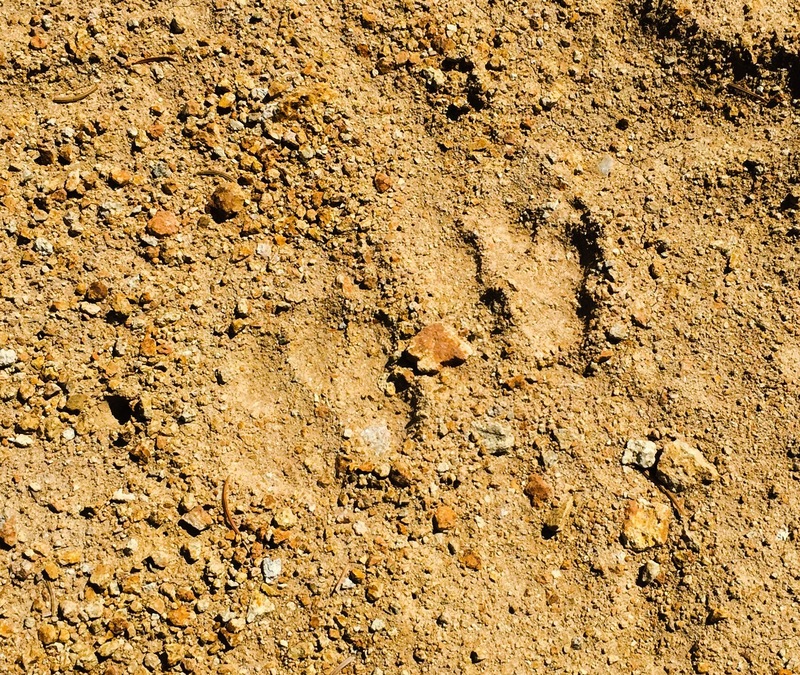 We saw lots of Bighorn Sheep in the distance, then found Mountain Lion prints. Still, this is the 5th month of the journey and it’s hard to believe where the time has gone. Another view of Rainier. It’s a very pretty mountain! 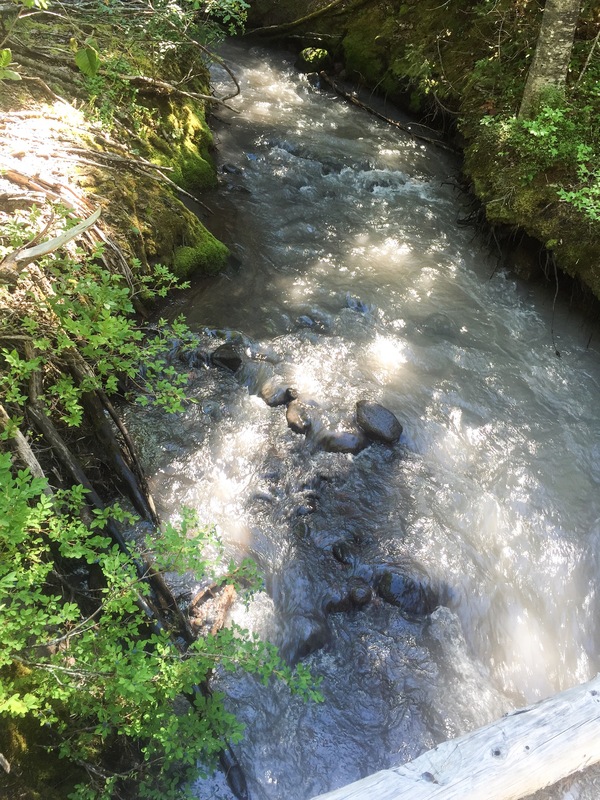 Lucerne Wash.­­— Yesterday, several hundred staff at Holden Village and Holden Mine Remediation were successfully evacuated through a combined effort with Holden Village, Rio Tinto, Lake Chelan Boat Company, Chelan County Sherriff’s Office and the US Forest Service. Holden Village is not threatened but a Level 3 evacuation was necessary as Lucerne Landing was in danger which is the evacuation route for the Village. Operations at the Holden Mine Remediation have been temporarily suspended due to fire activity. The Wolverine fire was very active overnight and into this morning, growing to approximately 4,000 acres. Late afternoon yesterday a spot fire was reported from the air ½ mile south of Lightning Creek along the lakeshore. The spot fire made significant runs up Lightning Creek and is now well established on Lightning Ridge. Helicopters engaged the fire with bucket drops in attempts to slow growth. At around 8:00pm another spot fire was reported across Railroad Creek which made a run uphill toward Domke Lake, where several structures were lost. 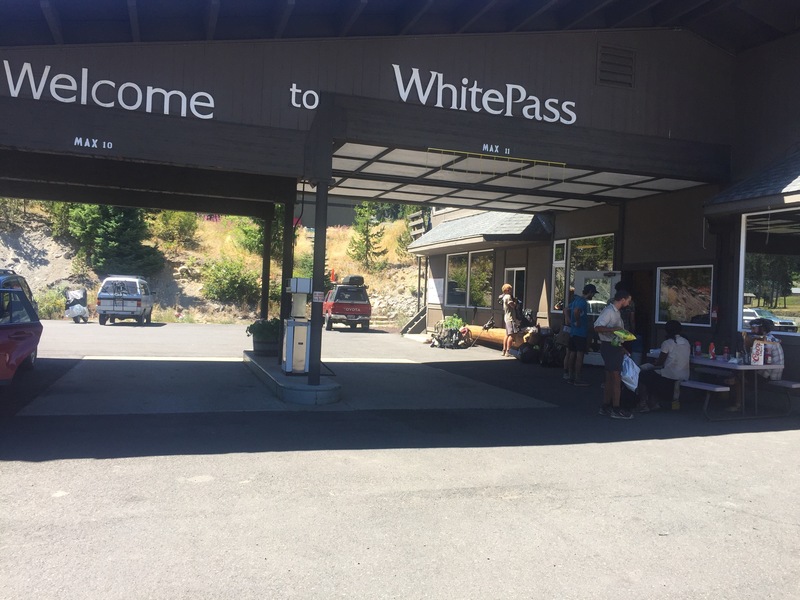 The owner of Domke Lake Resort at Domke Lake is safe and all guests had evacuated prior to the to the fires movement. The Entiat Hotshots performed burnout operations above Lucerne to protect structures. Combine spot fires are estimated at 1,200 acres. The main fire has also moved north across Riddle Creek and down the drainage. Sunday morning an overhead team will take over Wolverine Fire operations. More resources are on order to continue with suppression efforts and evacuation. 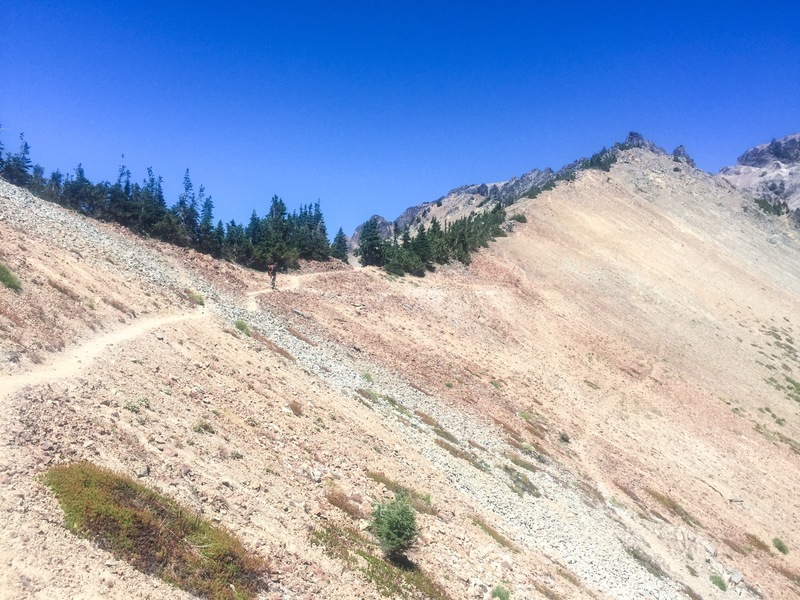 The Pacific Crest Trail Detour is CLOSED heading into Holden Village and out of Stehekin as conditions are rapidly changing on the ground. 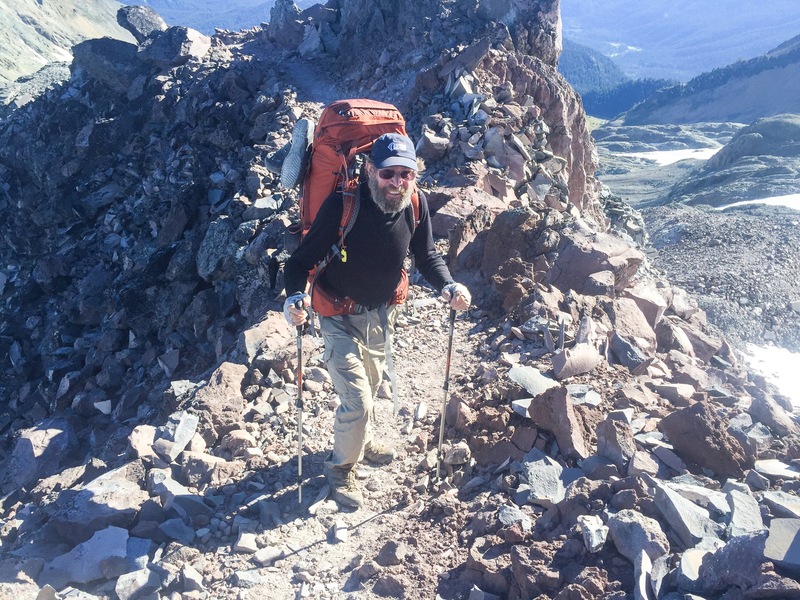 Northbound hikers will be rerouted out Suiattle River Trail to Suiattle River Road and can shuttle up Highway 20 to Rainy Pass and reconnect with the PCT. The Detour is CLOSED southbound in Stehekin at the Harlequin Bridge/Stehekin River Road. Southbound hikers will need to backtrack or take the Lady of the Lake into Chelan. 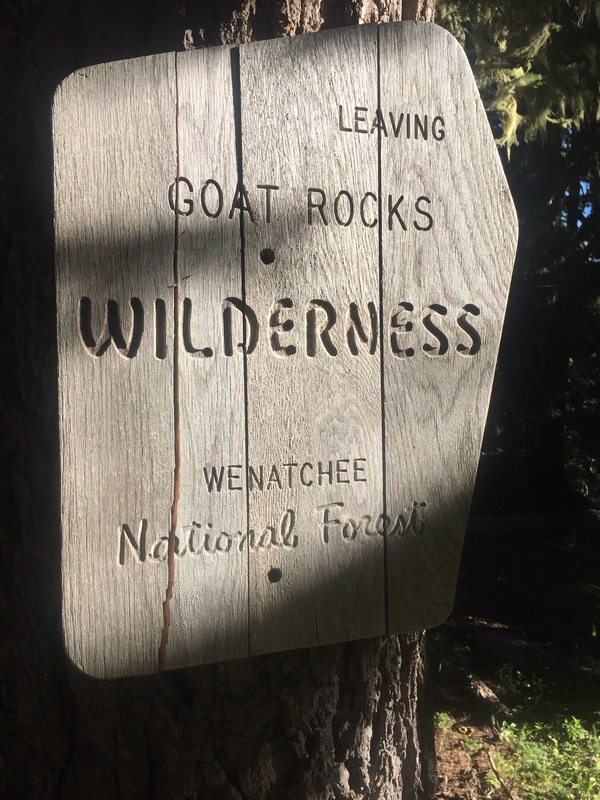 Hikers are advised to contact the National Park Service office in Stehekin or the Forest Service office in Chelan for information. Additional trail and area closures are expected in this area due to fire conditions. There is a Temporary Flight Restriction area established and pilots should avoid the area. Helicopters and fire suppression activities will be taking place along the shoreline from Refrigerator Harbor campground north to Stehekin Landing and boaters are requested to remain well away from the shoreline in the fire area. Level 3 evacuations are in effect for Holden Village, Lucerne, Riddle and Lightning Creek. Domke Lake, Lucerne and Refrigerator Harbor campgrounds are closed until further notice. Thank you, Michael, for sharing. I’m living vicariously through you and my big brother. 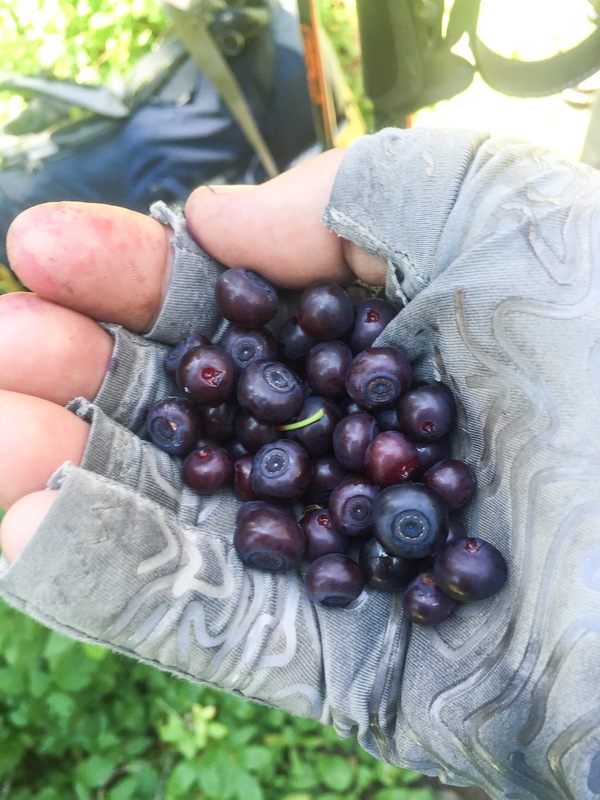 Wow, real mountain huckleberries! Awesome picture. Glad I met the two of you at the Portland Amtrak station. Keep up the great hike. Hi Mike” All your family and friends are so excited by your simply awesome adventure! That’s going to be a hard act to follow? In the meantime, hope you enjoy super good health as you walk hand in hand with nature. Really appreciate your Lovely stories and Great pictures! Thanks for posting!